My name is Alysia and I am a stay at home (but full time working!) mom of 2. For 6 years I worked in a tack/western store and I loved seeing all of the new crystal tack and belts start coming in. 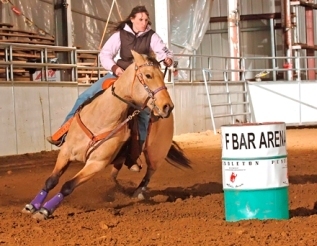 I also love barrel racing and you gotta have bling! Most of the tack was out of my budget so pretty soon I was super glueing rhinestones all over my belts and stamping and painting all of my old tack to make it look more fancy. When my son was born in 2006 I quit working at the tack store to stay home with him and started making a few saddle crosses to sell on e-bay. I started getting a few requests for headstalls and breastcollars and I needed a place to store all of my pictures and creations, and that's when RazzleTack.com was officially born. to choose from, and can put together tons of differnt styles of tack. e-mail pictures of samples I have in stock if you would like to see colors. Most hand painted and tooled items are made from Wickett and Craig leather with beautiful finished edges. One of my personal bronc halters, painted it 06 and still going strong! We use 100% genuine Swarovki crystal. are large animals and can break even the strongest leathers and materials.